The wild strawberry is no longer dotting our lawn red. We haven't been to a nature park in a month so I don't know if they are still brightening the understories of local woodlands. We knew the wild strawberry was edible before I looked them up in Edible Plants in the Wilderness, Volume 2, but it was satisfying to read the entry on our walkabout at Gulf Branch Nature Center. 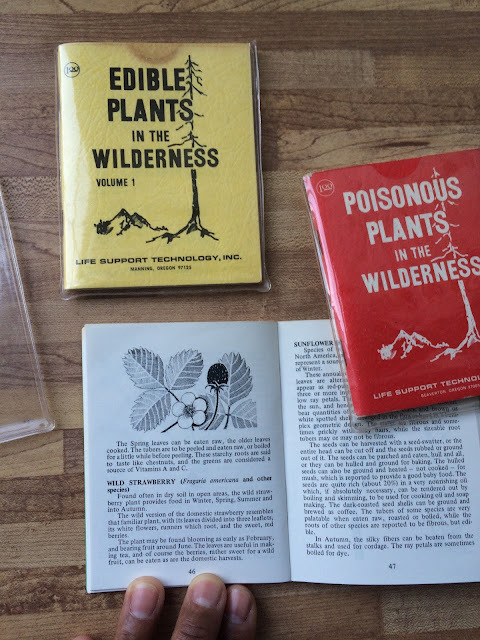 I received two volumes of Edible Plants in the Wilderness and one volume of Poisonous Plants in the Wilderness from Leslie of Urban Plants Research. She was paring down for a move and I volunteered to house these gems. The children especially enjoyed the fruit. Botanically, the strawberry is not a berry. It is an aggregate accessory fruit. Each strawberry has multiple matured ovaries each containing one seed (aka pericarps but note that some ovaries can hold more than one seed) on the exterior of the fruit. More specifically, according to Harold William Pickett in Botany for Gardeners, in the case of the strawberry, each of those pericarps, which some think of as seeds, is actually "a minute nut containing a seed". The leaves of the wild strawberry can be steeped as a tisane but I have not tried to do so. Have you eaten wild strawberries or drank a herbal of its leaves? Do you forage? What is a tisane? Is that like a tea? I work with herbs making infusions and tinctures, but I've never heard of a tisane.